Move on from traditional cement into what the professionals like to use: UV cures. 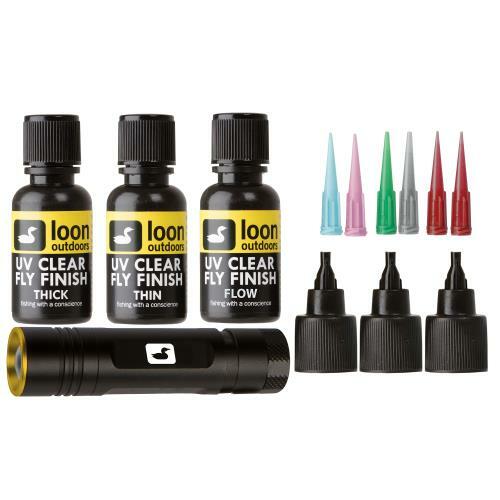 The Loon Outdoors UV Fly Tying Kit includes three UV fly finishes: thick, thin, and flow. With these finishes, you can tailor your flies to fit your needs. Also included in this awesome kit is the UV Bench Light so you can cure your flies at home or on the water. The Loon Outdoors Hard Head Cement is a water-based, thin head cement for adding a hard glossy finish to your fly patterns. This cement is odorless and dries clear, so no breathing in smelly, toxic fumes. The Loon Outdoors Hard Head Cement is easy to use; just apply the desired amount with the applicator brush, and never mix epoxy again. The Loon Outdoors WB Head Cement System is a water-based, thin head cement for adding a hard glossy finish to your fly patterns. This system is easy to use; just apply the desired amount with the applicator needle or brush. The Loon Outdoors WB Head Cement System dries clear and is odorless, so no breathing in toxic fumes. 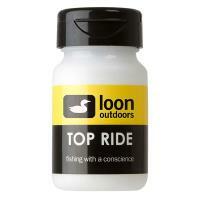 The Loon Outdoors Swax Dubbing Wax is an easy to use fly tying wax in a push-up dispenser. The Dubbing wax is perfect for applying dubbing to the finest of threads to create realistic looking bodies. 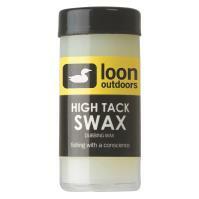 Use low tack wax for detailed work on small flies. High tack is best for larger flies, hard-to-dub materials, and dubbing loops. The Loon Outdoors Swax Dubbing Wax won’t leave your finger sticky when using, and easily washes clean. The Loon Outdoors Hydrostop is a permanent waterproofing treatment for new flies, so you can easily coat them with a floatant. The Hydrostop is perfect for the yarn-type indicators as well as pre-treated dubbing. It is easy to use and conveniently comes in a large container for hundreds of flies to be treated, dozens at a time. 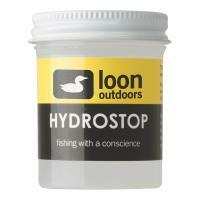 Soak flies with the Loon Outdoors Hydrostop, dry overnight, and then your flies will float higher. The Loon Outdoors Bench Kit has everything to help with fly tying. Included in the kit is dubbing wax for small and large flies, Hard Head for building up the bodies and heads, and Head Cement for precision tying. This kit is easy to use and an essential for those who love to tie their own flies. Treat your flies with Loon Outdoors Henry's Sinket so they quickly break the surface and rapidly drop in the water column where fish reside. Apply Henry's Sinket coating to nymphs, wet flies, and streamers. This special coating helps nymphs get deep and roll along the bottom naturally. 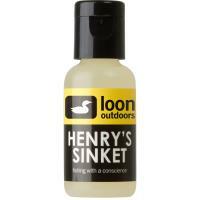 Don't wait for your flies sink, make it happen on the first try with Loon Outdoors Henry's Sinket! Move on from traditional cement into what the professionals like to use: UV cures. 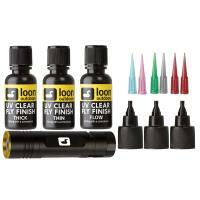 The Loon Outdoors UV Fly Tying Kit includes three UV fly finishes: thick, thin, and flow. With these finishes, you can easily tailor your flies to fit your fishing style or water conditions. All of these finishes will cure within seconds with sunlight or a UV light. Also included in this awesome kit is the UV Bench Light so you can cure your flies at home or on the water. The UV Clear Fly Finishes are environmentally friendly and won't yellow or fade the color of your flies. 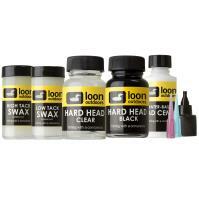 The Flow finish is the thinnest available from Loon, cures clear and hard, and can be used as a head cement replacement as well as to coat heads, bodies, and midges. The Thick finish is excellent for forming your flies into the ideal shape. The Thin finish is perfect for delicate presentations and making smaller heads, bodies, or wing cases. 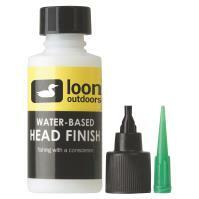 The Loon Outdoors Mixing Cup is constructed to be used with head cements and UV Clear Fly Finish. This cup is perfect for mixing and blending cements, thinner, and other fly tying powders. The base features a suction cup to securely keep the cup in place on your work surface. 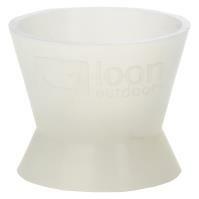 The Loon Outdoors Mixing Cup reduces clean up. Cements will not stick to the cup, and once dried, the mixture will just pop out of the cup. 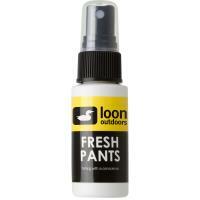 After a long day on the water and your waders, wetsuits, or gloves are smelling funky, use Loon Outdoors Fresh Pants Wader Deodorizer. To kill odor-causing bacteria, spray the deodorizer inside your waders and wipe dry with a clean cloth. This deodorizer works with both neoprene and breathable waders. Next time you spend all day on the water, don't let your gear smell like it with Loon Outdoors Fresh Pants Wader Deodorizer.